Like most of you, my fridge is still full of those decadent holiday leftovers. And like most of you, I am trying find new and creative ways to use them up. That is why tonight I decided I was going to make some delicious omelets. Everything was going swimmingly until it came time for the fold. *sigh* Alas the non-stick coating in my pan is not as non-stick as it used to be, so I had to improvise, but I am so glad I did. What came of this near kitchen disaster was the most delicious Southwest Scramble I have ever tasted. I know you are going to love it so let's get started! This is a quick cooking meal so before you even turn on the stove, take the time to prep all of your meat, cheese, veggies, eggs, and butter. Next, place a skillet over medium/low heat to get hot. Add the butter to the skillet and let it melt. Next add the ham, scallions, peppers, garlic salt, and chipotle power to the skillet and saute until heated through. 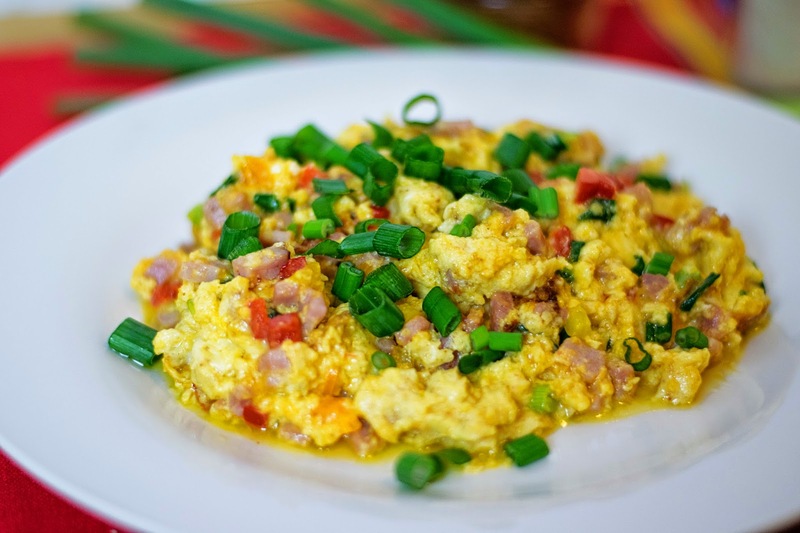 Now you can pour the beaten eggs over the sauteed veggies and ham. With your spatula, slowly stir until the egg whites are fully cooked and the eggs appear creamy. I actually add a little shredded cheese to mine as well. Plate them up, garnish with a little of the scallions, and ENJOY! You see, dinner doesn't always have to be big, heavy meals to be good! Something as simple as a few eggs, some leftover ham, and pantry staples can all come to create a culinary delight in your mouth! 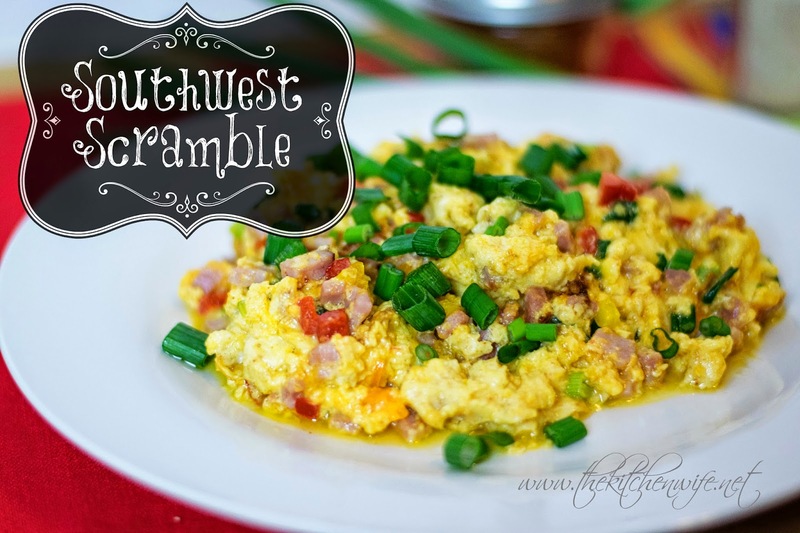 This Southwest Scramble is creamy, savory, spicy, everything you want in a hearty weeknight meal and I know you are going to love it! Prep all of the ham, cheese, eggs, and vegetables. Place skillet over medium/low heat and allow skillet to get hot. Add butter to the skillet and allow it to melt. Add the ham, vegetables, and spices and saute until heated through. Next pour the beaten eggs over the ham and vegetable mixture. With a spatula, slowly stir the egg mixture until the egg whites are fully cooked and the scrambled eggs are creamy.